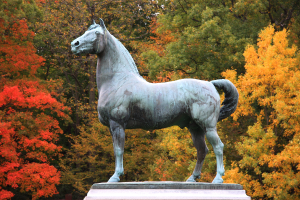 Come learn about the Vermont State Animal, America’s first breed of horse – the Morgan Horse. Located in scenic Weybridge, just 2.5 miles from downtown Middlebury, is a stately pastoral scene from a grandiose era gone-by. 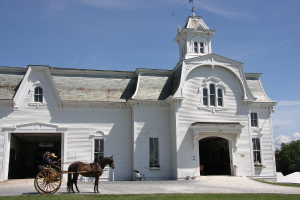 This working horse farm has been a breeding and training facility for Morgan Horses since its construction in 1878. As a university owned non-profit, the UVM MHF stewards continuation of the breed and education about this important Vermont State Animal. 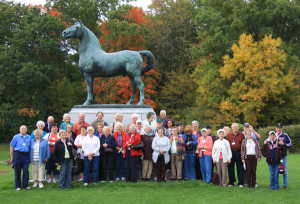 Whether horse enthusiasts, history buffs, or just excited to see the beauty of the Vermont countryside; this attraction has something to offer everyone. 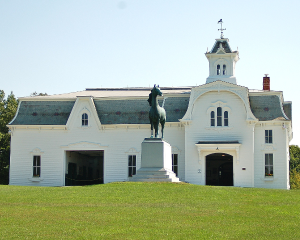 The UVM Morgan Horse Farm has guided tours and a gift shop. 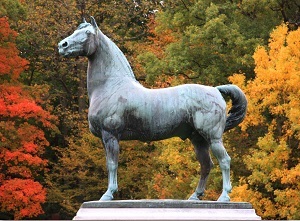 Enjoy some of the finest examples of this breed within our herd of 40-60 registered Morgans, whose origins come from a single stallion “Figure,” immortalized on the grounds by life-size bronze statue. Come learn about America’s first breed of horse, the Morgan. Open May –October, everyday from 9am-4pm (last tour is at 3pm). Foals are typically born in April-May and foliage is peak in October. Tours may be scheduled outside this date range with advanced booking, depending on Farm schedule. $5 for adults, $4 for teens, $2 for children, (ages 4 and under free). Groups larger than 20 people enjoy a discounted rate of $4 per adult with guides comped. To ensure the best guest experience, two group bookings per day is typically maximum. All groups must be scheduled in advance.